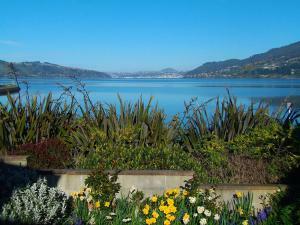 Arts Content Bed and Breakfast offers self-contained accommodation on the Otago Peninsula. Guests enjoy free breakfast, free WiFi and lovely bay views from your private patio. Located 15 minutes’ drive from central Dunedin, it offers free parking on site. Each morning you will enjoy a generous breakfast basket comprising of eggs from own hens, a choice of cereal, fruit juice, fresh fruit, a selection of home-made jam, fresh bread, home-made muffins and yoghurt, plunger coffee and English breakfast tea. Arts Content B&B is 15 minutes’ drive from Toitu Otago Settlers Museum and 20 minutes’ drive from Forsyth Barr Stadium. Guests enjoy easy access to the wildlife attractions of the Otago Peninsula. The split-level house has a private lounge, dining and kitchenette, which is located upstairs and opens to a large patio overlooking the harbour. The bedroom, with an en suite bathroom, is located downstairs. Important Information: Please note that children under 18 years of age cannot be accommodated at this property. Please inform Arts Content Bed and Breakfast in advance of your expected arrival time. You can use the Special Requests box when booking, or contact the property directly with the contact details provided in your confirmation.